One of the most problematic issues in your Teardrop trailer is MOLD! The best way to handle mold is to stop it before it happens by preventing moisture intrusion. Moisture in a Teardrop doesn't have to be the result of leakage, it can result from condensation of moisture from your breath on cool/cold objects. The problem is that you can usually only see it on glass but moisture can condense on any surface cooler than the air. Proper ventilation will add years and years to the life of a trailer. Ventilate when you are in your Teardrop keeps moisture from building inside and ventilate when it is sitting for the same reason. If mold does make its way into your Teardrop trailer, Teardrop Fix-It-Shop recommends using a non-bleach mold cleaner such as Moldaway. 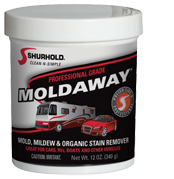 Unlike bleach, Moldaway won't damage the surfaces in your trailer or leave a residue behind. For more information and to order, click here to go to the Shurhold website.